Skye is happy with her boyfriend Hamish, her job at the gym and her blossoming art career. Even though she’s been through some tough times with the loss of her father, her life is on track. When she meets Ben, though, things change instantly. For reasons she can’t explain, Skye is instantly attracted to Ben, and she senses that he feels the same. Soon she is throwing away her steady relationship and starting a new, all-consuming one with this new man. Wrapped in the bliss Skye is sure she has found the love of her life and as if nothing can go wrong – until she discovers that Ben is the one man she should never be with, and her world falls apart. 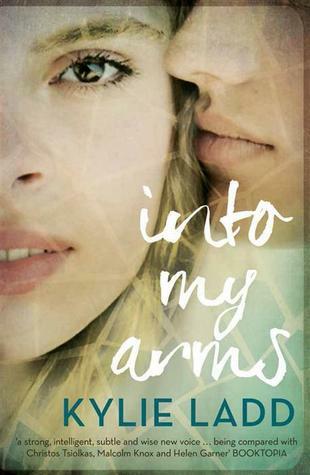 Into My Arms is a heartbreaking, captivating novel which deals with a subject which is both confronting and highly plausible. The plot twist is one which leaves the reader chilled, and Ladd cleverly takes us along so that we feel the protagonist’s pain and suffer her dilemma. The apparently simply answer is not simple for Skye and Ben, and we are invited to empathise, even whilst being shocked. Subplots also explore important issues and their impact: Skye’s twin brother is gay and faces a childless future; one of her students is a refugee whose family has been separated and struggles to cope; and Skye’s father has died after a battle with dementia. Yet for all of this, this doesn’t feel like an issues-driven book – rather the issues form part of the mesh of a wonderfully engaging, absorbing story. Not an easy read, but a rich, satisfying one. Rory Buchanan is popular with everyone. He’s good looking, he captains his cricket side, and is surrounded by friends. So when he collapses and dies suddenly, his friends and family struggle to cope with their loss. When they got to the hospital and she gave her name at the emergency department desk and she gave her name at the emergency department desk the staff reacted so quickly that Nick knew Rory wasn’t suffering from a stomach ulcer. Rory Buchanan is popular with everyone. He’s good looking, he captains his cricket side, and is surrounded by friends. So when he collapses and dies suddenly, his friends and family struggle to cope with their loss. Rory was the glue that seemed to hold them all together, and now that he’s gone friendships are under stress, marriages are being tested and individuals are facing where they are at – and where they want to be. Last Summer is a clever examination of loss, and what it can mean to people. Told from the varied viewpoints of nine different people – all friends and family of the dead man – it explores not just the immediate aftermath of a death, but also how it can alter lives and relationships. The characters are a blend of male ad female and come from a range of backgrounds. What they have in common is their membership of the cricket club, and their friendship/connection with Rory. Without Rory there, those connections become more tenuous, and even strained. Handling nine different viewpoint characters – plus several other characters – could prove too much for a writer, but Ladd does it well. Over the course of the novel the reader gets to know each character intimately, with cause for crying with the, cheering for them, and even being angry at them, as if they were real people – which they are, because Ladd makes them so. The only downfall of the book is that ends, leaving you wanting to know what happens next to the characters. I had been married three years when I fell in love. Fell, collapsed, stepped off the kerb and found nothing but air. Oh, I already loved my husband of course, but this was different. That had been a decision; this was out of my control, an impulse as difficult to resist as gravity. Kate and Cary are happily married, and considering starting a family. Their friends Cressida and Luke are similarly in love and content in their marriage. But when Kate and Luke recognise a growing attraction and then, impulsively, act on it, the world of both couples comes tumbling down. Their affair is secret, but places a strain on their marriages – and when Carey decides he wants a baby, and Cressida has a chance to work overseas, it becomes increasingly difficult to maintain the charade. When Cressida discovers the affair, it looks like both marriages will be over. Can things ever be the same? After the Fall is an intriguing tale, told from multiple perspectives – with the four central characters each giving their first person perspective in alternating chapters, and occasional chapters from the perspective of a friend, Tim. This format, and the sequencing of its telling allows a dissection of the events leading up to the affair, the affair itself and the aftermath, with the reader allowed to see the perspective of all participants, though still able to build differing sympathies for the varying characters.